WITA® - Wilhelm Taake GmbH produces exclusively in Germany. This is the only way to ensure the high quality standard of our products. 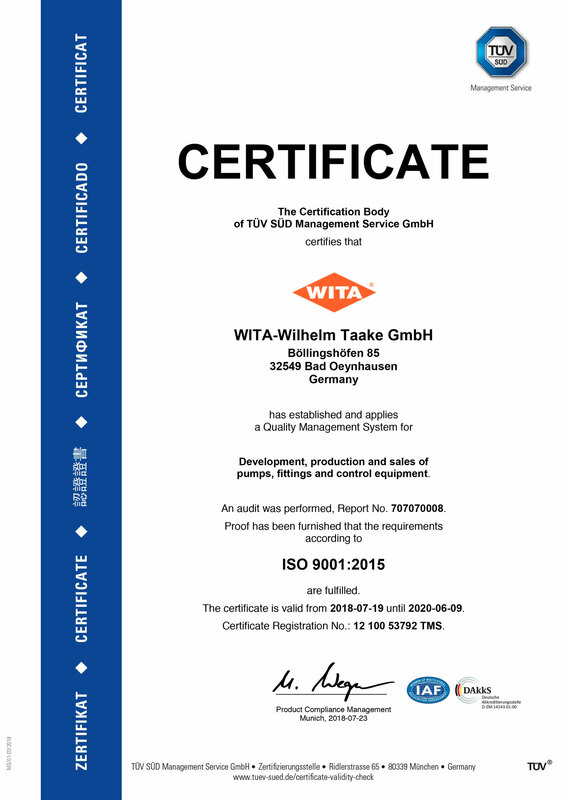 WITA-Wilhelm Taake GmbH was once again certified according to DIN EN ISO 9001: 2015 in the areas of production, assembly and distribution of pumps, fittings and control technology on 29.06.2018, and the internal quality policy, which has already been adopted for decades, has also been documented externally. The effectiveness of the quality management system is checked by means of regular internal audits or is monitored continuously by TÜV SÜD Management Service GmbH. Have you failed to find a suitable product for your application? Together, we will find a solution!